Birds rely on water just as much as they need food, so give birds clean water to drink, and it will in-turn attract them to the food. Birds appreciate a clean place to take a bath, to not only groom themselves, but also stay healthy. Suet is type of bird food that is high in fat, providing birds with extra protein for energy. Suet comes in a small square block that is placed in a wire mesh suet holder. Suet is great for feeding birds that might not come to a regular feeder, and also is great for the cold winter months when birds need that extra energy. The number-one choice for the largest variety of birds. The most economical seed that will be sure to get birds to your backyard. The seed preferred by larger birds, such as cardinals and jays. Sunflower seeds without the hull or shell. Because there is no shell to crack open, a greater variety of birds can enjoy these hulled seeds, including mockingbirds, wrens, woodpeckers, chickadees, titmice, nuthatches, gold finches, house finches, cardinals, grosbeaks, sparrows, and jays. Great for feeding on decks, patios, and gardens because no messy shells fall beneath the feeder. The top seed choice of finches. Not a favorite of squirrels, so they are less likely to try eating from your feeder if it contains Thistle (Nyjer seed). A highly desirable seed that attracts many of the same birds as Black Oil Sunflower, such as chickadees, titmice, nuthatches, gold finches, house finches, grosbeaks, and jays. A small round seed that has several different types including White, Red, and Golden Millet. Mostly offered in mixes of bird seed. 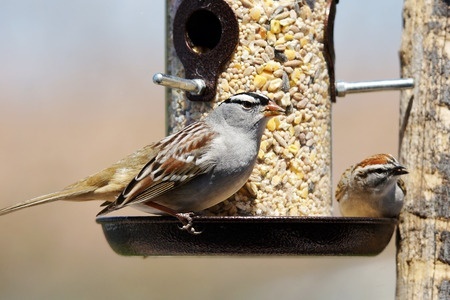 Enjoyed by ground-feeding birds, including doves, sparrows, juncos, bobwhites, and quails. Also known as Sorghum, a less desirable seed often offered in more inexpensive mixes. High in carbohydrates – enjoyed by doves, sparrows, quails, and tohees. Dried corn kernels that have been cracked into smaller pieces.